The UK’s All Party Parliamentary Group on Srebrenica welcomes the decision of the International Residual Mechanism for Criminal Tribunals that found Radovan Karadžić guilty of genocide of Muslims in Srebrenica in 1995 and sentenced him to life in prison. It, therefore, condemns in the strongest manner the decision of the Republika Srpska National Assembly to establish a commission to deny that Srebrenica was a genocide by undermining the rulings of international courts of law. Such actions of genocide denial not only exacerbates the hurt and suffering that the survivors have had to endure, but presents a serious risk that threatens to destabilise the already fragile process of reconciliation and peace. The harmful effect of those who deny the genocide and glorify the perpetrators reverberates across society in not only Bosnia but across the world. Earlier this month, a “Chetnik” rally was held in Višegrad in Eastern Bosnia glorifying those who murdered 3,000 Muslims in so-called “ethnic cleansing” in that town. In New Zealand, the perpetrator of the Christchurch terror attacks who brutally murdered 50 Muslims was listening to a Serbian nationalist song which glorified Radovan Karadžić. These events illustrate the damaging consequences that ensue when people continue to deny genocide and glorify the perpetrators. It underlines the importance of why we must continue to challenge such narratives and work to combat the revisionist agenda of those who seek to downplay the significance of the awful events that were committed by people like Karadžić who should not be lauded as a hero but denounced for their evilness. 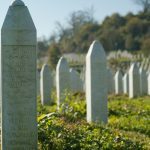 The UK’s All Party Parliamentary Group on Srebrenica will continue to challenge genocide denial wherever it finds it. This attempt to rewrite history also reaffirms our purpose of coming together to raise awareness of the truth commemorate and learn the lessons of the Srebrenica genocide.